The 2K Sports team announced today that the cover athlete will be Kobe Bryan #24 on the LA Lakers. 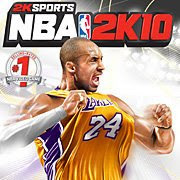 2K Sports today congratulates cover athlete and spokesman of NBA 2K10, Kobe Bryant of the Los Angeles Lakers, on his fourth career NBA championship after recently defeating the Orlando Magic in the 2009 NBA Finals. Bryant, who averaged over 32 points, five rebounds, and seven assists during the series, was named NBA Finals MVP and this fall will lend his championship pedigree to NBA 2K10, the #1 selling basketball video game* and #1 rated NBA simulation.